The simplest paper chromatography experiment at home is a paper chromatography of a black marker. On this page you'll find very simple setup with some details that allow you to achieve the best results separating your samples. 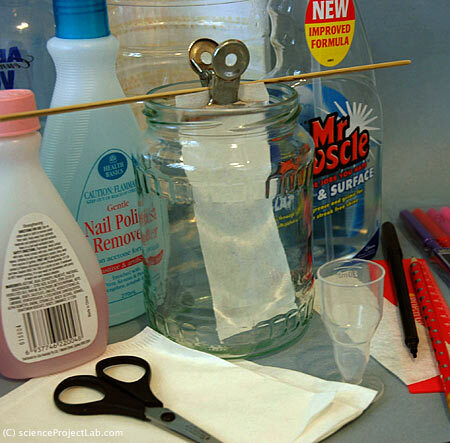 You can compare this experiment with Thin Layer Chromatography setup for home. Perhaps you'll want to try both setups and compare results. to achieve the best possible separation of the black marker pigments using paper chromatography. Paper chromatography uses capillary force that move water or another solvent and the sample up the paper strip. The most soluble compounds of the sample will go farther the less soluble will stay at the start line. Using chromatography we can find out how many components are in paint, inks, markers as well as in natural dyes, leaf extracts. As long as mixture is colored we can see their components. Colorless mixtures can also be separated with paper chromatography, if we can visualize separated compounds with colored chemical reaction(s). Check our article that explains the principle of chromatography. Chromatography paper(stationary phase) Coffee filter or blotting paper or paper towel may also work. Different papers have different properties and will separate substances more or less successfully. We had the best luck with coffee filters. Chromatography chamber. 1 liter glass jar will do. Solvents (mobile phase). There are many different solvents and their combinations you'll need to try. We used: water, vinegar, acetone(nail polish), rubbing alcohol, glass cleaner. Cut the chromatography strip out of the coffee filter (or other paper, see above). The length of the strip depend on the height of the chamber the width does not matter but it should be able freely get in the chromatography chamber. Draw a pencil line one inch from the bottom of the strip. It will be you start line. For our black marker experiment draw short line along the start line. If you're trying to separate something else put your sample(s) on the start line with small capillary or toothpick. Pour solvent into the chromatography chamber (jar) just to cover the bottom. Put the strip of the chromatography paper with sample(s) in the chromatography chamber, so that bottom of the strip touches the solvent. Important! Start line should stay above the solvent! You'll see how solvent "climbs" up the strip dragging the sample with it. Watch color spot going up the strip and possibly separating on individual components. Remove paper from the chamber when solvent front are inch or two away from the top or if it doesn't move up any more. Mark where the solvent front is and where are the middle of the color spots (if you lucky to get any). Write the solvent combination and proportions on the strip for future reference. Selection of the right solvent combination for chromatography is the very important, see images below. It's also the most time consuming part of the process, so be patient. Try each available solvent and note the result or simply wright solvent's name on developed paper strip. Keeping records will help you organize your data. Perfect chromatography looks like colored spots with a space between them. It's difficult to achieve such a result at home so don't be upset if you only can make a black marker to separate into the rainbow bands. It is actually pretty good result. Unfortunately, good solvent combination for the black water marker may not work for other substances. If you want to separate natural dyes or different markers or ink, you'll have to find their best solvent composition. Black marker chromatography using water as a mobile phase. Black marker chromatography using combination of glass cleaner and white vinegar in 10:1 proportion as a mobile phase. The number of the spots or bands tells you how many compounds are in your substance. Their color and the distance they traveled might help you to identify those compounds. You can try to find out which dyes were used in black marker using other markers from the same package as a reference samples. If certain reference color sample will travel the same distance (rf) that one of the black marker colors both of them likely to be the same chemical compound. You can't identify the chemical substance by paper chromatography, but you can roughly analyze the mixture with this simple and neat technique.